The post liberalization era India has witnessed unprecedented growth. Dr Manmohan Singh, the then Finance Minister is credited for initiating and scripting India’s growth story since 1991. On 24th July 1991, India’s finance minister Dr Manmohan Singh wound up his historic Union budget speech with Victor Hugo’s famous words “No power on earth can stop an idea whose time has come. I suggest to this august House that the emergence of India as a major economic power in the world happens to be one such idea.” This was his idea of India. In the 10 years of UPA – the Prime Minister Dr Singh has lived up to his words. India is on the verge of becoming a super power in the world. It has become the third largest economy in the world. It is important to note that India was on 10th position in 2005, when Dr Singh took over. He has assured India’s place at the high table of the G 20 economies of the world. Under the Congress-led UPA government’s stewardship over the last 10 years, India has not only become a nearly two trillion-dollar economy, achieving the fastest pace of growth in our history, we have also seen the benefits of growth percolate deeper to the Aam Aadmi. The period when the UPA government has been in power has seen the highest growth rate in our history as India grew at an average rate of 8.2% between 2004-05 and 2011-12. 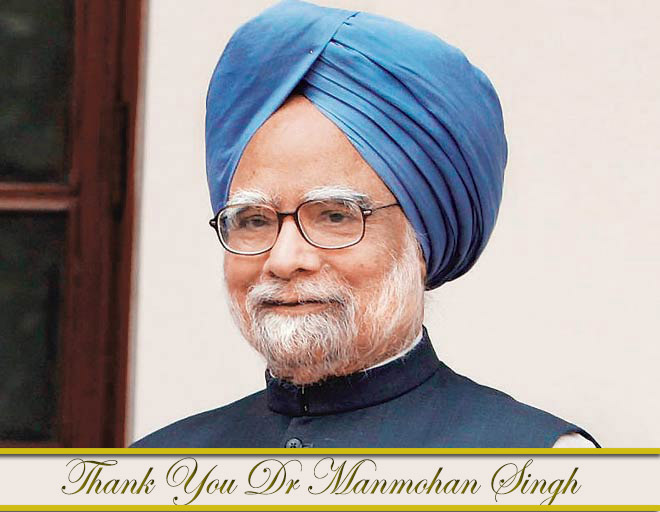 In the last 10 years, India grew at an average of 7.7% Even as the world went through economic downturns due to the financial crisis of 2007-08, India continued to grow, thrive and prosper under the wise leadership of Dr Manmohan Singh, widely recognised as one of the world’s foremost economists. If we read Dr Manmohan Singh’s budget speech of 1991-92 again and quote. The UPA Government under his leadership has kept these words in mind. UPA has introduced a series of Right based laws which legally guarantee – Right to Work (NREGA), Right to Information (RTI), Right to Tribals (Forest Rights Act), Right to Education and now Right to Food. These inclusive measures have ensured that the wealth created by the growth figures reach the last man in the queue- The Aam Aadmi. India’s social indicators have improved. Immunization programmes on Polio have been successful. Health infrastructure has improved with the help of 108 Ambulances services in each state. During UPA, lakhs of km of Rural roads under PMGSY have been built. UPA has built 3 times more National Highways than the previous government. One important aspect which is often being missed, while taking in record Dr Singh’s government, is the fight against corruption and stress on institutional reforms to curb corruption. Critics have been harsh on it. The biggest step is the AADHAAR- cash transfer-using e-governance to stop leakages. Just yesterday, the President of India gave assent to Whistleblowers Protection Act. There have been several other acts and bills which have been initiated in his term. The Lokpal and the Lokayukta Bill has been passed by the Parliament. Aadhaar- Direct Benefits Transfer- Institutional architecture to facilitate a shift to a system in which benefits from the government would get transferred directly to the bank accounts of individual beneficiaries of various social sector schemes. It is no joke that UPA is building one of the biggest Infrastructure project in the world- The Delhi-Mumbai Industrial Corridor,Amritsar- Kolkata Industrial Corridor and the Chennai-Bengaluru Industrial Corridor. These would be the corridors of growth and would be our manufacturing spines of future, giving millions of jobs. That is the vision of our Dr Manmohan Singh, the man of impeccable integrity, a man who would be rightly judged by the history- as a man who took India forward. This entry was tagged BJP, Congress, Dr.Manmohan Singh, India, Narendra Modi, Politics, Rahul Gandhi, Sonia Gandhi, UPA. Bookmark the permalink. I would just like to quote what a friend Ms. Shaheen wrote about our PM just yesterday. Quote, “Thank You, Dear Prime Minister. You did a formidable job, with this ungrateful, media brainwashed country. I just second those words!